which American master poet William Heyen referred to as "sui generis." of the mind is its will to bliss; the élan of the brain when pleasured/is poetry." appear in a '65 Corvette convertible and take us all along for the ride. and anthologies. 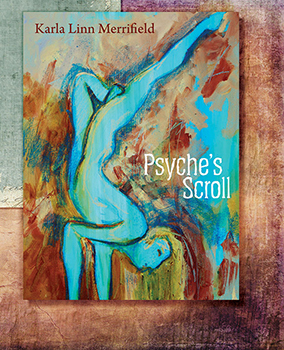 With Psyche's Scroll, she has thirteen books to her credit. You're probably wondering which one. stitched on your Versace cashmere? your crystal bowl full of Beluga caviar? of Château Haut-Brion 1984 in your wine diary? step back from your monied tableau.